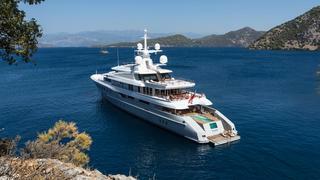 The story of 72.5 metre superyacht Axioma (ex-Red Square) started in 2005 when Sedat Ergun, owner of the Ursa Shipyard in Turkey, who had been working in the financial and civil engineering sectors, decided to take the yard owned by his family and transform it into a superyacht building operation. 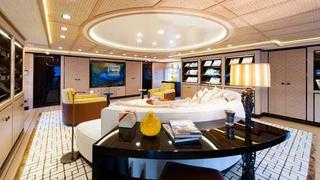 ‘We had this yard—the Ursa Shipyard—where we used to do small refits on yachts up to thirty-five meters,’ he explains. ‘I really wanted to do something more international. I thought at that point that yacht building was easy. So a partner and I founded Dunya Yachts as a brand and our plan was to build and sell spec boats. It was before the 2008 financial crisis and it was a very good idea at the time. 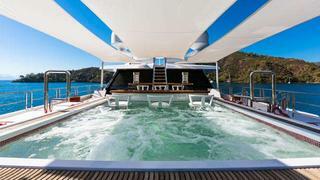 At that time I was an investor, nothing more, and I really didn’t know anything about yachting or yacht construction. When the crisis happened things started falling apart. My business partner and I parted ways, and I had to make major changes in the management of the yard. With Axioma's lines drawn by Diana Scott of Sterling Scott in Monaco and with the late, great yacht designer Pinto taking on the interior, Ergun and his team finalized the general arrangement and began building the yacht on speculation. Ergun’s philosophy was as simple as the interior brief. The list of suppliers and subcontractors on the build reads like a Who’s Who of the top end of yacht construction. The interior joinery was built by the Austrian company LIST; Van Cappellen did the sound and vibration; the paint is Awlgrip; Quantum provided the stabilizers; the navigation equipment is Raytheon and so on. But despite this investment in expertise, the price still works out favorably for the client due to the labor rate. 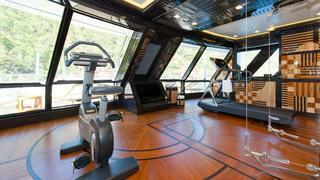 ‘The price of this superyacht was thirty percent lower than the other guys,’ Ergun says. 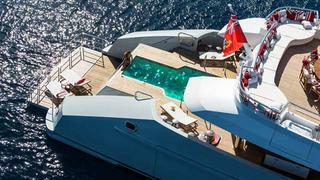 ‘Our goal is not to build cheap, but to build to the highest standards possible using the best proven brands in the world…and the math will do its work.’ Proving his approach, within a month of the yacht’s completion, she was sold through Yachting Partners International with the deal signed at the Monaco Yacht Show in September 2013 and soon renamed Axioma by her new owners. Ergun used a similar philosophy when creating the interior layout. 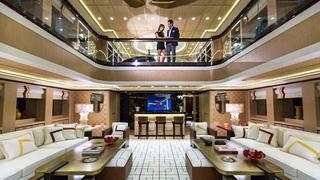 ‘When yachts get bigger, typically all you do is double the spaces – the lounges, the dining areas. So we decided to combine these areas to create something new for a seventy-meter, creating a wow effect by combining two decks.’ The result is the spectacular atrium gallery at the aft end of the main salon, creating an incredible sense of space and airiness while connecting the upper seating area with the salon and bar below. The same thinking dictated the guest cabins’ location. 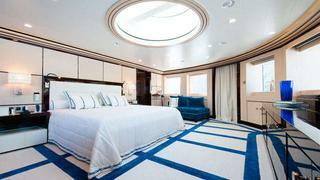 ‘We put all the guest cabins on the main deck with a brief for large windows to let in a lot of light,’ he says. In fact, the only guest area on the lower deck is the cinema, with the rest of the space given to crew and technical areas. The materials and hues used by Pinto are simple, with hints of color in the throw cushions and occasional furniture and with variations in texture creating a sensual feast that does not overwhelm. The style is modern, and very much allied to that idea of a comfortable, contemporary summerhouse rather than a glitzy hotel. On the technical front, Ergun researched exhaustively to get the best spec, choosing twin Caterpillar engines that give exceptional range. 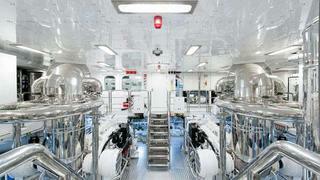 Axioma can do 6,000 nautical miles at 12 knots with respectable fuel consumption. Axioma is being offered for charter through YPI. 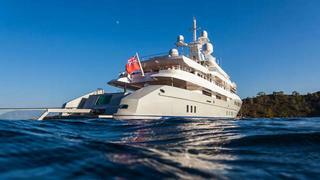 And as for Dunya, the yard has a 262-footer already in build with the hull nearly complete. Ergun says that they will take lessons learned and feedback from this first launch and incorporate it into the new build. There’s little doubt that when the next yacht emerges from the yard there will be no disappointment.